I don't suppose it would be of the least bit of interest to you that I have spent the better part of two days at the spa. Getting a steam treatment. I outta have the BEST complexion going! Even better, it didn't cost me a thing. of my very own steam iron? So, instead of me showing you the pile of ironed pieces of denim and such that I have dealt with over the past while, I will send you off to visit some interesting things round and about cyberspace. 1. Mary Corbet has an interesting article HERE about the care of vintage linens. She says they were made to be used, and she's quite right. Knowing how to take care of them might just make you want to display those treasures you have stuffed in a drawer somewhere....or.....even (gasp) do as I do and cut them up for use in your creations! 2. Vicki of 2BagsFull has extended the deadline for her Josephine's Children charitable project to Dec. 15th. She is collecting crafting supplies to send to children in Uganda and you still have time to donate some of your excess crafting things to an extremely good cause. Go HERE to read more. I lightened my stash a little and I challenge you to do the same. 3. I know I've sent you to see some of the magnificent embroidery that is done by Michele Carragher and I know you will enjoy seeing even more. Go HERE to be amazed!! Today the quote is from Bob Dylan.... "A man is a success if he gets up in the morning and goes to bed at night and in between does what he wants to do"
Yes, I actually got something done today, believe it or not. Our little grandson is going to have a new Christmas stocking. I thought this quote was rather interesting (it comes from an internal memo at the Western Union, dated 1876)..... "This telephone has too many shortcomings to be seriously considered as a means of communication. The device is inherently of no value to us" Somebody at Western Union certainly had it wrong!! I don't have anything to show you yet, but I do have something that I found that is utterly amazing for you to go and see. A man, named Paul Smith, who was born with severe cerebral palsy, used an ordinary typewriter (yes, you read the correctly) to make the most beautiful pieces of art. There's a video on you tube about him and his art as well. I can't seem to get the direct link to work, but if you Google his name and/or typewriter art you will find him. Such an inspirational man!! Today the quote, which is very fitting I think, comes from William Ellery Channing.... "Difficulties are meant to rouse, not discourage. The human spirit is to grow strong by conflict"
And the quote today is from Anonymous... "You watch the fellow who drives ahead - and the fellow who drives behind. You watch to the right, you watch to the left - You drive with a calm clear mind. But the fellow you really have to watch is the fellow behind the fellow in front - and ahead of the fellow behind"
Karen Ruane has been working with gimp in the Simply Stitch 5 class and seeing that, I was reminded of the gimp pieces I have in my stash. The story behind me having this in the first place revolves around my mother, who was born in 1916. She, unfortunately, was one of the people who contacted tuberculosis and at the age of approximately eighteen was sent away to stay at a sanitarium that was devoted to nursing care for those affected with the disease. She spent four years there and during that time she did a lot of creative things, including making purses and belts using gimp. The piece you see here was meant to be a belt, but when I found it in her stash it hadn't been completed. I have since cut off pieces to use in my first white wrapping cloth and now I'm contemplating trying to unravel this (or at least some of it) to re-purpose the gimp for embroidery applications. I'm sure my mothers' thrifty soul would be pleased! One little side note about having had TB back in those times....my mother often said that the patients were made to sleep outside on open verandahs (there was mosquito netting in the summer) all year round. She said she would wake up with a covering of snow on her blankets. It's so hard to think of her having to go through that. Today the quote is an Irish blessing, from an unknown author.... "May the blessing of light be upon you, light without and light within. May the blessed sunshine shine on you and warm your heart til it glows like a great peat fire, so that the stranger may come and warm himself at it, and also a friend"
First of all - I've been meaning to post a picture of the exciting gift that our #2 son and daughter-in-love gave me when they were visiting a few weeks ago. The two red skeins of yarn are 'Golden Crown Suri' - an absolutely gorgeous lace weight yarn made from alpaca. So soft and luxurious! The single ball in the front of the photo is Qiviuk which is made from the fine inner insulating layer of the Canadian Arctic Muskox. It's also lace weight and there's enough yarn in that single ball to make a beautiful scarf. They included the pattern in the gift (for the Qiviuk) and I've since ordered a cowl pattern from the company who makes the alpaca yarn. And yes, I'm definitely intimidated to even start knitting with such expensive and luxurious yarn!! If you want to learn more about these yarns I'm sure you can google 'Qiviuk' and/or Heavenly Alpaca. Many of us in Canada have been pretty much glued to the news reports today after a horrendous terrorist attack at our nation's capital, following closely on another attack earlier in the week that happened in Quebec. We don't like to think that these sorts of things can happen here, in a largely peaceful nation. Obviously they can. The people who do these sorts of atrocities deserve nothing but our extreme disgust. Our prayers go out to the families of the soldiers who have died, as well as to those who have been injured. Today I am giving you a quote from Napolean Hill.... "Until you have learned to be tolerant with those who do not always agree with you; until you have cultivated the habit of saying some kind word of those whom you do not admire; until you have formed the habit of looking for the good instead of the bad there is in others, you will be neither successful or happy"
Over the weekend I finished the purse! Yay! Had to take pictures in a hurry because the person who commissioned it dropped in unexpectedly and I wanted her to take it with her when she left. Today's quote is from an unknown source... "The ornament of a house is the friends that frequent it"
Today I have chosen a quote from Joe Cordare.... "To the question of your life you are the answer, and to the problems of your life you are the solution"
For today, I thought you might like to see the view I am seeing this afternoon from my studio window. There has been a little break in the clouds and dullness and the sun broke through long enough for me to grab a couple of pictures. This tree is almost directly across from my window. There is a paved path that runs from the roadway and beneath these trees and from there along the river to the downtown core of our town. In the picture below you can get a better sense of the river and walkway. I have also completed the third section for the crazy quilted purse. Three down, one more to go!! For the 'site' part of this post, you might want to go and check out something amazing HERE. This woman knits with glass!! 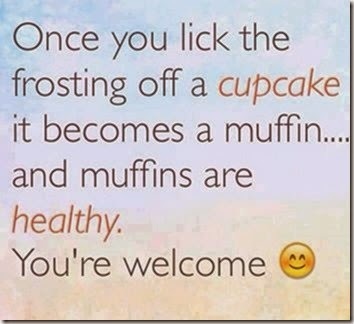 And yes, you read that right! Today the quote is from an unknown source.... "You know why it's hard to be happy? It's because we refuse to let go of the things that make us sad"
My evening knitting has produced what my crazy quilted teddy is sporting - it's a baby-sized balaclava (the first of two I plan to make). The pattern is the 'Cozy Bay Hood' by Patons and is a free one. I found it on the AllFreeKnitting site. 1 ball of Patons Astra yarn is enough for the small sized hat. Today the quote is from Bruce Lee...."Absorb what is useful, discard what is not, add what is uniquely your own"
I'm sorry to say there are no pictures to be seen on this blog today. I apologize profusely for being remiss in that regard, but perhaps I can be forgiven if I tell you that it was because we were taking my s-i-l to a medical appointment and that I haven't been home since dark-thirty this morning. The astute among you might (or, more likely, might not!) have noticed the sudden disappearance of the BlogLovin button in my sidebar. Those of you who read my rant about them last week might even have been expecting it. Yes, the bloom is off the romance, the divorce papers were filed and it's over, don't let the door hit you on the way out. To recap....for weeks now bloglovin has been driving me nuts. It wouldn't let me mark blogs as having been read and I was ending up have to check each blog each and every time I signed in to see if there had been anything new posted since I last visited. Then it went through a period where it wouldn't let me sign out of the site and continually demanded that I update my profile. To what? Why? Well, then it decided that signing out at all, update or not, was not doable. Oh, and maybe later in the day all would be back to normal, leading one to think that the fart it was holding crosswise had been released. Nope...it wasn't to last, and the next time I visited it would be back to being grumpy. Repeated emails (and postings on their site) were ignored. I asked for suggestions for a new feeder in one of my posts last week and received several suggestions (thank you!). Deepa suggested one called 'Inoreader' and I checked it out, along with all of the other ones that were mentioned. Inoreader had really good reviews and, seemingly, has a good customer support system in place. It is very much like the old Blogger feed used to be and, so far, I like it. Thank you Deepa for telling me about it. Hopefully this blog will return to the regularly scheduled mumblings tomorrow, but in the meantime I will leave you with another quote from Anne Lamott... "I do not understand the mystery of grace, only that it meets us where we are and does not leave us where it found us"
First of all, I want to extend best wishes for a very happy Thanksgiving to my Canadian friends. It's a good time to pause and take a few moments to reflect on the blessings each and every one of us has in our lives and to hopefully enjoy some time with family and friends. Sorry to say it's not a very good photo because it's dull and dreary here today which doesn't make for great pictures. The piece on the right has been my 'evening-tv-viewing-time' project for the past week. It's crocheted using fine cotton and is destined to be a Christmas gift, along with a nice candle. For those who might be interested, I found the pattern on Ravelry..."Rose Doily #804". Today's quote is from an unknown writer.... "A friend is someone who knows the song in your heart and can sing it back to you when you have forgotten the words"
The quote today is from Susan Harris.... "Anyone can be happy when times are good; the richer experience is to be happy when times are not"
Yes, I've been busy stitching but didn't take time for any pictures today so I have nothing to show you. 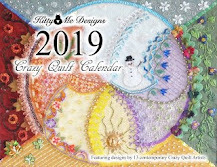 Instead, I thought I'd tell you that Kathy Shaw of Shawkl has her beginner's crazy quilting online class listed again and she's taking registrations until midnight CST on October 12th. You'll have to hurry if you want to join in the fun. Best of all? IT's FREE!! 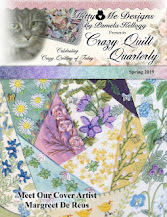 I guarantee that you will learn a lot from Kathy so if you've ever wanted to learn to crazy quilt this is a good way to start. Go HERE for further details and how to register. I've been seeing the work from her students posted about the internet and hearing them talk about what fun they're having, so it must be a great class. Today's quote is from Elie Wiesel.... " When we die and go to heaven, our Maker is not going to say, why didn't you discover the cure for such and such? The only thing we're going to be asked at that precious moment is why didn't you become you?" - first of all, Karen Ruane as a new two week online class available. If you haven't taken any classes from her before (and even if you have!) you can check it out HERE. - I received the latest newsletter from Carole Brungar and noticed that she has her journal making class available HERE. Please note that the start date in April isn't current. Some of you may remember the journal I created a few years ago when I took Carole's class and how happy I was with it. HERE's a link to one of my blog posts about my journal. I can guarantee you that both these ladies are wonderful teachers. I have learned so much from them and I know you would enjoy their classes. Now, on to the pictures for this post. I'm currently working on another crazy quilted purse which has been commissioned for Christmas. Thought you might like to see some of the seam treatments I've done so far....many of them are designs created by Pam Kellogg of Kitty and Me Designs, some were using the stencils that Sharron Boggon sells and some came out of my head (ouch!). Today the quote is from an anonymous source.... "Let the beauty of what you love be what you do"
A 30 lb. pumpkin = 10 pies and a large pot of THIS soup! A trip up north to collect our winter's supply of fresh cranberries from the marsh = a stop in Bala to see the water going over the dam. Same trip = some beautiful leaves. And finally, a finished baby blankie - knitted, with a crocheted border. Today's quote is from Joseph Addison.... "Three grand essentials in this life are something to do, something to love, and something to hope for"